When it’s used as a verb, I think of “retreat” in a military sense–to go backward to safety. There is an inherent tension between this meaning and the meaning of a writing “retreat,” since the purpose of the latter is to make forward progress. Sometimes in order to make progress, I feel like I have to detach myself from the rest of my life and go somewhere else. That’s what I’m doing this month. I’ve gone away to an undisclosed location (OK, the photo is a big hint), to a place from my past, to revise the novel I’ve set here. I’ve heard tell there are people who can work on their novels without retreating, withdrawing, from their regular lives. They have a lot more self-discipline than I do. I have a difficult time segmenting my brain in a way that allows me to switch back and forth at will. So, I’m revisiting another episode in my life, a different time and place. The trick is to keep this location from distracting me. I’m trying various schedules to figure out what works best. 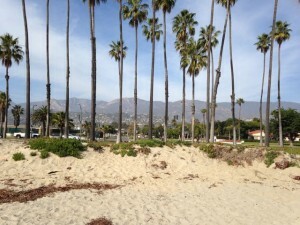 This morning I went to the beach around 7:30, walked and read, then came back to my rental house to work. Revision is not a pleasant task for me. Today I’m writing a brand-new scene, expanding the role of one of the secondary characters. This is the kind of work I enjoy best. I’m also employing one of the techniques suggested by Michelle Hoover in her revision class (part of the Grub Street Novel Series): retyping my whole novel. I was skeptical, but I’m finding that the act of retyping from a paper manuscript serves a few purposes. One is to free up my mind by distracting my fingers in the mechanical act of typing. Another is to scrutinize each word and sentence and cause me to ask its purpose. Finally, I hate revising. I never know where to start, what to cut, what to rearrange. I like composing from scratch. This gives me the illusion that I’m writing a whole new novel, in a blank Scrivener file. So far, I like it. We’ll see if I make it through the entire manuscript this way. Can I trick myself into finishing this novel revision by the end of the month? Stay tuned. I’m feeling pretty good so far. Why is it that the last ten percent of anything requires ninety percent of the effort? Finishing any project, whether it’s writing or something else, threatens to nullify everything I’ve done up to that point. A reader isn’t interested in a story that’s extremely close to being done; nor would a friend be excited about wearing a hand-knitted sweater with three-quarters of a left sleeve. If I don’t finish, I’ve wasted the other ninety percent. So here I sit, with a handful of short stories that are just about there, only not quite. Why is it so difficult to finish? Sometimes I run out of time. When I start something like a thorough house cleaning in advance of guests’ arrival, I’m often overambitious, tackling the woodwork and the dust on the crystal droplets of the chandelier. At some point, after admiring my reflection in the streak-free bathroom mirror, I look at the clock and realize there’s still clutter covering the kitchen counters. TIme to start throwing things in drawers. Some stories feel like that too. I’ve set my sights on sending a story to a contest. As the hours tick toward the deadline, the loose pieces of the story start getting thrown in metaphorical drawers. Hitting the “submit” button brings closure and a sense of relief, but rarely first prize. I end up editing the story yet again before submitting it elsewhere. Sometimes I’m just bored, tired of going over the same paragraphs, the same sentences, and feeling they just aren’t going anywhere. There was something in the story that made me want to write it in the first place, but I can’t seem to find the level of enthusiasm to sustain me until the end. A couple of times I’ve tried to go back to the inspiration for the story, to see if I could throw out everything else and start again. For some reason, that hasn’t worked. My mind wants to travel back down the same path. So I set aside that story and start a new one. I have an inventory of “set aside” stories that I like and want to finish polishing, get them just the way I want them, but my attention span just isn’t that good anymore. Too much distraction, too accustomed to instant gratification. The way we live now isn’t conducive to sticking with one thing through to the end. Today I’m determined to finish rewriting a story I wrote at Writers in the Heartland September 2011. It’s been through a few drafts and two or three workshops. It’s been rejected by three journals. I love the characters and the themes. I really want the story to be published. Somehow I need to push through the last ten percent. Today’s the day. I need to do it. It’s simple as that. Today I want it more than I did yesterday. Friday March 23 I was the moderator for a panel at the 2012 Virginia Festival of the Book sponsored by WriterHouse, an organization of which I am a founding member. This was a panel I initiated, after hearing that Margot Livesey’s new book, The Flight of Gemma Hardy, was a reimagining of Jane Eyre. I had also read Hillary Jordan’s book, When She Woke, and knew that it was a reimagining of The Scarlet Letter, so a vision for a panel began to form. 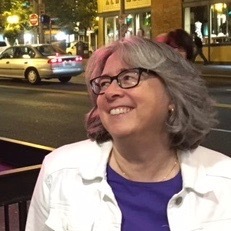 When I heard Sharyn McCrumb would be coming to the festival with her latest book, The Ballad of Tom Dooley, an Appalachian version of Wuthering Heights, I knew we had a winner. We had a lively discussion, with a standing-room-only crowd in the McIntire Room of the Jefferson-Madison Regional Library main branch. Some of the topics of discussion: retelling vs. reimagining, what is it about classic tales that make them grist for retelling, how each author navigated the question of how close to stick to the original story (Sharyn McCrumb included actual dialogue from Wuthering Heights, Hillary Jordan’s characters’ names are very close to those in the Scarlet Letter, Margot Livesey used the broad plot outline of Jane Eyre with some rearranging of characters and relationships). And afterward, there were many books to sign. Hillary Jordan, Margot Livesey, Sharyn McCrumb signing books. Author John Casey in the background. I just received this in the mail from an ebay seller. 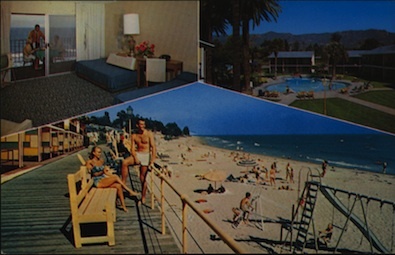 It’s a postcard from a hotel where I worked in 1980, which is the model for the setting of my second novel, tentatively entitled The Sea View Hotel. It’s not a great title, I know, but I’m not going to worry too much about that now. I say it’s the “model for the setting” because it’s not the exact setting. The setting is my memory of the place with some embellishments. I’ve messed with the geography and the name and a lot of other details in order to make the place fit the story. But it’s nice to have this tangible memory-jog while I’m writing. These photos were taken long before I worked there, but it didn’t change much during that period. I’ve been thinking about other talismans that I might like to have while revising this novel. We used to have some really crummy white plastic ballpoint pens with the company logo on them. It would be fun to find one of those. I found an old matchbook on ebay, but it was from a much older era with an older logo. I could probably download some music from 1980. These things aren’t absolutely necessary, but they help put me in the right frame of mind. I’m in the midst of massive revisions right now, and hoping to have something complete enough to enter in the Amazon Breakthrough Novel Award for 2012. That will require some focus and discipline. Since the month of December should be fairly quiet around here, I have a decent shot at it. Wish me luck. I’m currently at VCCA (The Virginia Center for Creative Arts) in Amherst, Virginia, working on my second novel and a couple of short stories. The idea of a residency is to allow writers (and other artists) to take a break from their everyday responsibilities and focus on their creative work for a concentrated period of time. This works extremely well, except for the wireless internet. The other day when I was not getting anywhere on my novel I realized I was wasting a lot of time online. Then I decided, since I wasn’t getting anything done anyway, I would create a wiki for writing residencies. A wiki (like wikipedia) is a crowdsourced information repository–a website that can be edited by anyone. If you’ve ever been to a residency, please add your .02 to the listings there. There’s also a discussion page for each residency program, in case you want to start an argument. My contributors copies of Crab Orchard Review arrived in the mail while I was away at Writers in the Heartland. When I got home, it was exciting to see my name on the back with at least one other I recognized (poet Erika Meitner). This story is excerpted from my novel, A USEFUL LIFE. Here’s hoping its publication will generate some interest in the novel. I’ve written a novel. It’s not published (yet), but I’ve written it. So have a boatload of other people. Some of them have been published, and I’m Facebook friends with a number of them. 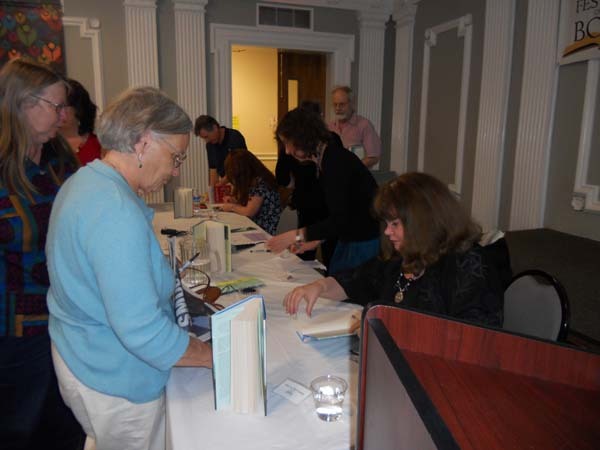 I meet authors through my volunteer job as president and author event organizer for WriterHouse (a nonprofit writing community center), organizing and moderating panels at the annual Virginia Festival of the Book, and at places like the Sewanee Writers’ Conference. 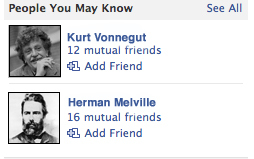 When my Facebook friend list reached some critical mass of authors connected to other authors, I started getting a lot of suggested friends that were pretty famous. Now almost all the suggestions I get are people that I wouldn’t in a million years presume to ask to be my Facebook friend unless I were in a position to meet them sometime. Apparently all authors are connected to all other authors by not that many degrees of separation. I wonder, do other professions/arts work the same way? If you’re an aspiring musician, does Facebook suggest you “friend” Elton John? What’s your experience of the connectedness of your global community? I just found out that a story excerpted from my unpublished novel A Useful Life will appear in Crab Orchard Review‘s Special Issue: New & Old ~ Re-Visions of The American South. It’s scheduled to come out in September. The excerpt comes from the chapter about the 1878 yellow fever epidemic that decimated Memphis, telling the story of a fictional Jewish family and how they deal with the tragedy. I titled the story “The Ninth of Av,” after the Jewish holiday commemorating the destruction of the temple in Jerusalem. In 1878, Tisha B’Av, as the day is called in Hebrew, occurred on August 8. At some point while revising that section of the book I realized that was about the same time of year as the yellow fever epidemic which nearly destroyed the entire city of Memphis. I saw that for my Jewish characters there were some parallels between the two events, so I juxtaposed their personal family tragedy temporally with this important date in Jewish history. I’m thrilled to have a story coming out in such a respected journal. It’s a big milestone for me. When I was researching my novel, I found it helpful to have artifacts that made me feel connected to the world my characters inhabited. Orton and Sadler’s Business Calculator and Accountants Assistant is one such artifact in my collection. It was published in Baltimore in 1877. One of the authors, W.H. Sadler, was the president of Bryant and Stratton Business College there. 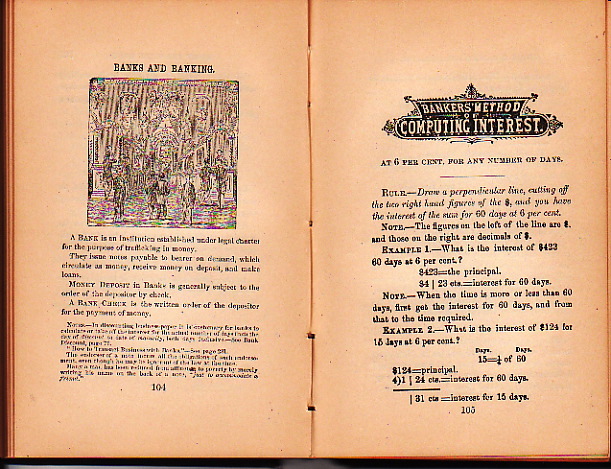 The title page proclaims it “A Cyclopaedia of the most concise and practical methods of business calculations, including many valuable labor-saving tables, together with improved interest tables, decimal system: showing the interest on from $10 to $10,000–rate, ten per cent. per annum.” In 1888, the price of the book was $1. I purchased it for $10 more than a hundred years later. Two of my characters are bankers in the 1880s-1890s, so this book seemed like something they could have used. It’s a handy little compendium of everything from shortcuts for arithmetic computation to determining the weight of live cattle. 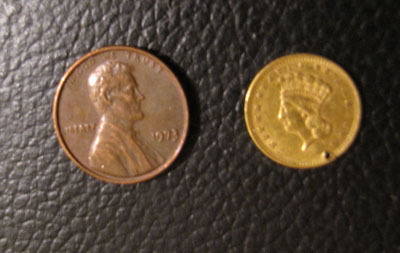 Need to “Ascertain the cost of one quire of paper” in cents per pound? Page 264 has a handy table. How many cubic feet of stone constitute a perch? 24.75, of course. This was the interwebs in your pocket. I thought I would have one of my characters refer to the book or use one of the tables, but I never found any natural way to work it in. I keep the book on my shelf, though. It’s one way I can touch the nineteenth century. This idea might not be so strange. Jack Finney‘s characters used clothing and other artifacts to facilitate time travel through self-hypnosis in his book Time and Again and its sequel From Time to Time. I’m not a big science fiction fan, but that’s one of my favorite books. Perhaps there’s a bit of Finney seeping through my subconscious, giving me the idea of time travel through objects. How about you other writers out there–do you collect objects to connect in a tangible way to your characters’ lives as you research?